Rare 1 Acre Lot in Lake Shastina! Full Description: WELCOME TO LAKE SHASTINA!! One of the VERY FEW 1 acre lots available in this subdivision!! Located on a short cul-de-sac street, this large lot features GREAT views of LAKE SHASTINA, a possibly view of Mt. Shasta & is situated in a fairly quiet part of the area! Close to many recreational activities including, Lake Shastina, Mt. Shasta Skiing, hiking, biking, boating, etc. Take a look at this one today! NOTE: The accuracy of the information provided is deemed reliable but is not guaranteed, is subject to change and should be independently verified. This listing has been viewed 19 times. Siskiyou Living is your guide to Siskiyou County Real Estate. Siskiyou Living features property listings for sale in Siskiyou County, California including the cities of Yreka, Montague, KRCE, Lake Shastina, Scott Valley, and Big Springs. 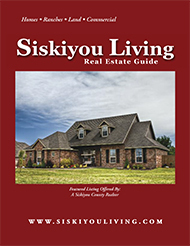 The Siskiyou Living Real Estate Guide is published monthly by Quality Advertising and distributed throughout Siskiyou County. View the digital version of the current months guide, or view our archive of past guides. For more information on a listing, please contact the local agent on the listing page. Siskiyou Living is not a real estate agency. Click here to search all agents. Click here to contact Siskiyou Living (Quality Advertising).